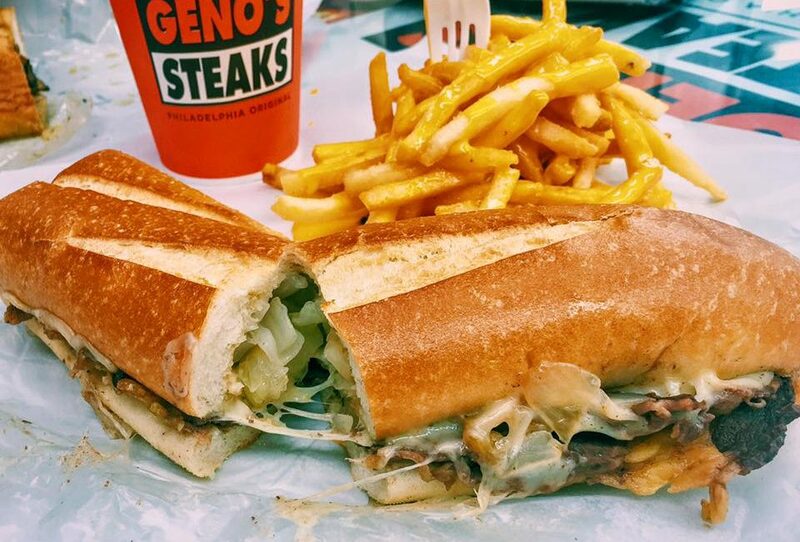 Cooking with ‘Friends’: Pat’s vs. Geno’s | A taste of the best Philly cheesesteaks! Well when you think about Philadelphia, what do you think about? Cheesesteaks, right? Absolutely. Last hour, Ann and Clayton introduced you to the owners of Pat’s and Geno’s, the two most famous Philly cheesesteak joints in Philly. Now, they are back to settle what is the best. Clayton is at Geno’s and Anna is playing the role of the person at Pat’s: King of Steaks. What do we got, Clayton? CLAYTON: And the competition begins. GENO: Ready to make some sandwiches? CLAYTON: Yeah. Let’s go Anna, you and me. And fan out the meat – right, Geno? Alright. Here we go. ANNA: Put on the steak first, and then the onions. FRANK: And the cheese goes last. CLAYTON: Like a deck of cards, Anna. ANNA: And you guys opened your business in 1930. Were you nervous was Geno’s opened? FRANK: No. Absolutely not. I was like 3 when they opened, but we weren’t nervous. Competition is healthy. We play off of each other. When my line’s long, they go across the street. When his line’s long, they come over here. ANNA: And it’s become a tourist destination, right? FRANK: It’s a tourist destination, but not a tourist trap. ANNA: Right. OK.
CLAYTON: Geno is showing me a little point in the hand here. A little point in the hand. GENO: The little pointer finger we call it. CLAYTON: I was doing better a few moments ago. GENO: Just get right underneath of it. Don’t be afraid. CLAYTON: I’m not afraid, Geno. I’m not afraid. I was born to do this. I even have the pencil behind my ear. Ann, how are you doing over there, southern girl in your white dress? ANNA: I’m doing well. I’m learning how to order. Is it wit or witout? FRANK: Wit or witout is the onion part. The cheese is cheese wiz, so they can say give me a cheese wit or a cheese witout. ANNA: OK. Now, how much cheese wiz do you go through? I understand in a day it’s about 175 pounds. FRANK: Yeah, it’s about 170 pounds. We sell enough cheese wiz in a year to fill up an Olympic sized swimming pool. ANNA: Filled up an Olympic size swimming pool, Clayton, with cheese wiz in a year! CLAYTON: How many slices of meat, Geno, do you put on a good cheesesteak? GENO: About six or seven. It depends on the size of the piece. CLAYTON: And not chopped, good rib-eye. OK, and ready for the sandwich? And with the little pointer finger… one on the cheese, two, three. And you guys got steaks back in the studios, right? GENO: Want some onions? CLAYTON: I’ll do a little onions, yeah. Oh, daddy – now, we’re talking. Guys, back in the studios, we sent some Pat’s and some Geno’s to you guys. And we’ve been taste testing them. Alright, which one do you like better? I like Pat’s. Which one do you like better? I like Geno’s. I’m just saying. I like Pat’s because they put a lot of the cheese wiz on there. This one doesn’t have any cheese. Hey folks, both Pat’s and Geno’s – email us and let us know which one you like better.